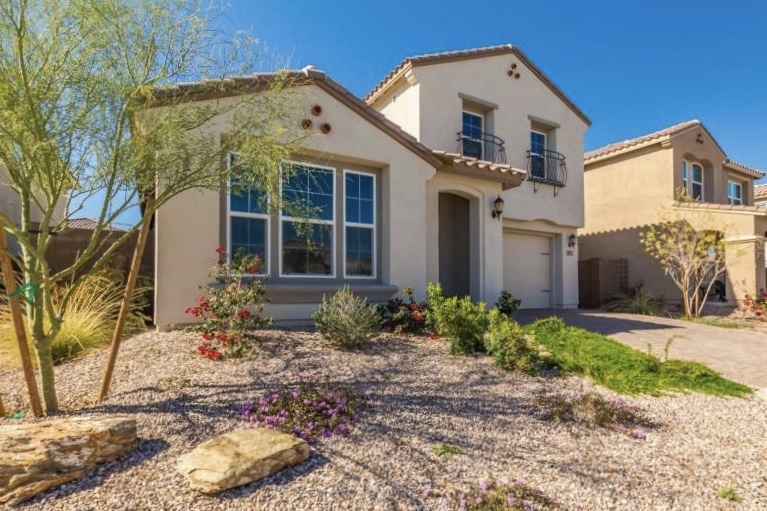 See why Vistancia has been ranked as the #1 Master Planned Community in Arizona for four straight years! This beautiful 2 story, 5 bedroom, 3 & 1/2 bath home offers upgrades throughout. 10′ ceilings with 9′ doors. A gourmet kitchen includes quartz counter tops, double oven, tile back-splash, and filtered drinking water. Master bedroom on the main level. Upstairs a loft offers play space for the kids. The home comes with refrigerator, washer and dryer. The two door garage with a tandem garage provide ample storage space. Only a 5-minute walk to the community pool, playground, hiking/biking trail and elementary school located in upper Vistancia. Still under Builder’s Warranty. Bathrooms are tiled with marble double vanities. Master bedroom has large walk-in closets and 5 piece bath.